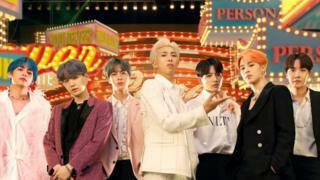 The new video for their song Boy With Luv, which is a collaboration with US singer Halsey, racked up more than 78 million views in the first 24 hours of release as of 10am (British Summer Time) on Saturday, according to YouTube. This beat fellow South Korean group BLACKPINK's record for Kill This Love, which they set last week by getting 56.7 million views in the first day. Boy With Luv also drew in a whopping two million comments within the first 24 hours. BTS will be performing their new song, as well as Idol, on hit US show Saturday Night Live later tonight. All seven songs from BTS's new album Map of the Soul: Persona, which was released on Friday, have made it into Apple's iTunes top 10 music chart in America. What do you think of their new song? Let us know in the comments below!